The EcoHitch® for the 2019 Subaru Forester is full of strength and appeal that complements your Forester. With this Subaru hitch, you’ll be able to bring your bikes, extra cargo and so much more. This receiver hitch is a hidden hitch, so that means only the receiver is visible once it's installed, rather than having to see an unsightly trailer hitch behind your vehicle. 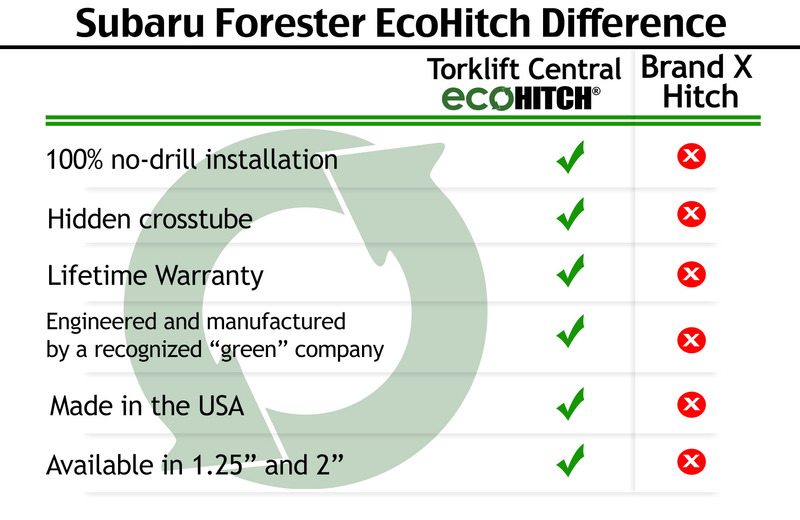 Although the factory towing rating is 1,500 pounds, the EcoHitch is rated for 525 pounds tongue weight and 3,500 pounds towing weight for increased safety while towing and hauling. *If you’re going to be towing and need trailer wiring, click here! Ensure your wiring harness does not drag on the ground by visiting our Eclipse trailer wiring bracket page. If you love your Subaru Forester, why not get a trailer hitch that allows you to maximize the capabilities of your Subaru? The Subaru Forester and Subaru Forester Sport EcoHitch is manufactured to match the Subaru Forester’s innovative design, fitting snug to the underside of your sleek car with just the receiver visible once it’s installed. The Subaru Forester trailer hitch is available in both 1.25-inch and 2-inch receiver sizes allowing you to choose which receiver best fits your needs. With the 2019 Subaru Forester hitch you can hook up a variety of styles of bike racks, cargo trays and more! Due to its lightweight and 100% bolt-on installation, this Subaru Forester trailer hitch makes sure your car remains the same without compromising its style or efficiency. What’s even better is that EcoHitch is compatible with hitch-mounted accessories. This means you can skip the inconvenience of roof racks that interfere with aerodynamics and cause strain when loading accessories like bikes. By using your EcoHitch, eliminate vertical clearance issues and potential damage to your Subaru while loading and unloading. Don’t lift overhead. Take it easy and save the excitement for your next adventure with EcoHitch for Subaru. x7391 37.5 lbs 43" x 12.5" x 26"
x7392 37.5 lbs 43" x 12.5" x 26"